We always love getting involved with the Num Nom cooking challenges so when they asked us if we would like to get involved in the Crazy Creations Challenge I thought it sounded like fun. Here was the Num Nom brief! We’ve seen the Cronut (donut and croissant combination), a genius idea, which brought together two of our favourite pastry items into one amazing desert. Next it was the turn of green tea cake, for the slightly more health conscious, which saw a refreshing cake born from a popular hot beverage. More recently, Marks and Spencer introduced the Croloaf, a loaf of bread make out of croissants –yum! 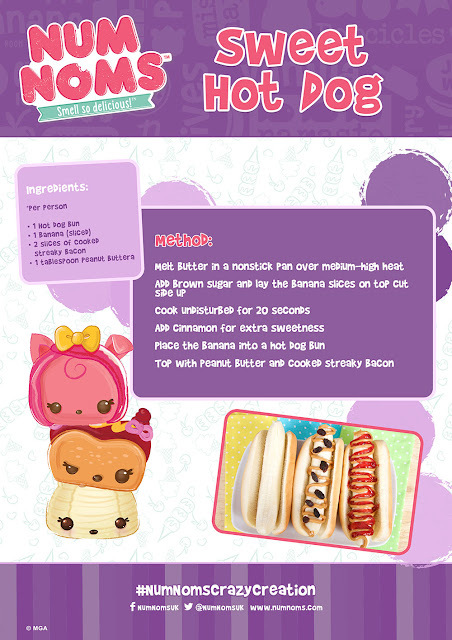 But they are old news and now it is time for Num Noms fans to take to the kitchen and create their own Crazy Creations inspired by the different Num Noms themes and flavours. Now it's time create your own Crazy Creation, whatever this may mean to you! It is a great way to get messy in the kitchen with the children and together make your very own recipe to shout about – no matter how simple or sophisticated. 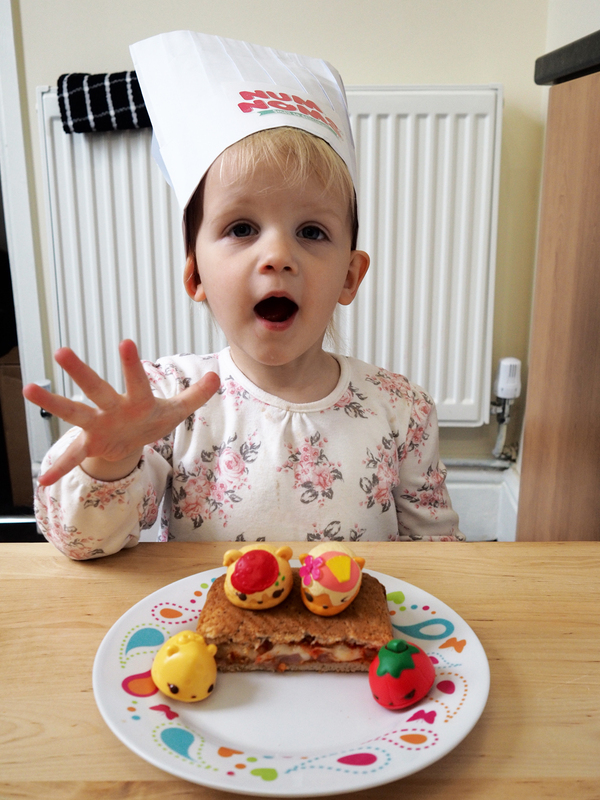 Num Noms sent us some series 3 Num Noms, a chefs hat and some ingredients cards to get us inspired. I particularly liked the hot dog idea. So now I had to think of my own idea. After seeing the hotdogs I wanted to try and make something pizza related as Lily owns the Pizza set from series 2. I did think about making a sweet topping pizza, and then thought about mixing pies and pizza's toggether to make a pieizza! But I really wanted to make it an activity that Lily would be able to pretty much do all by herself. Also something she would eat as she isn't a huge fan of sweet things. 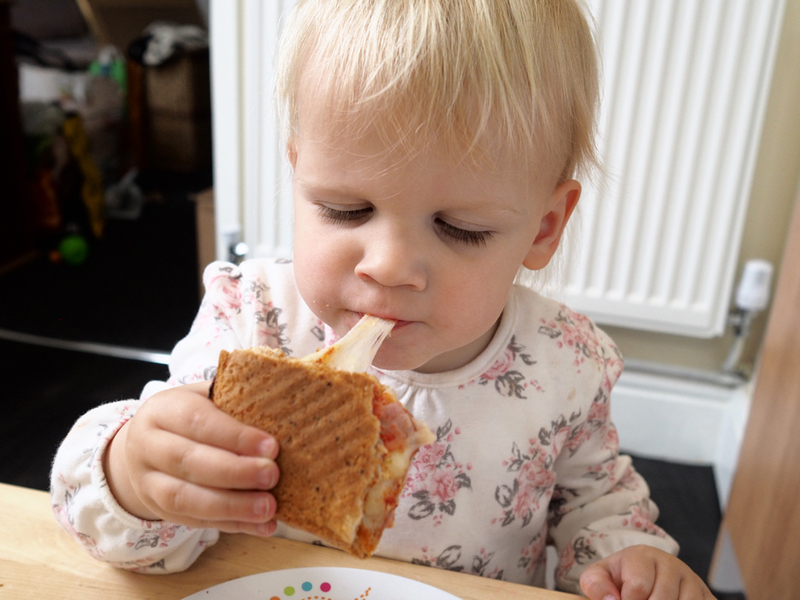 So we decided to make Pizza Sandwiches. 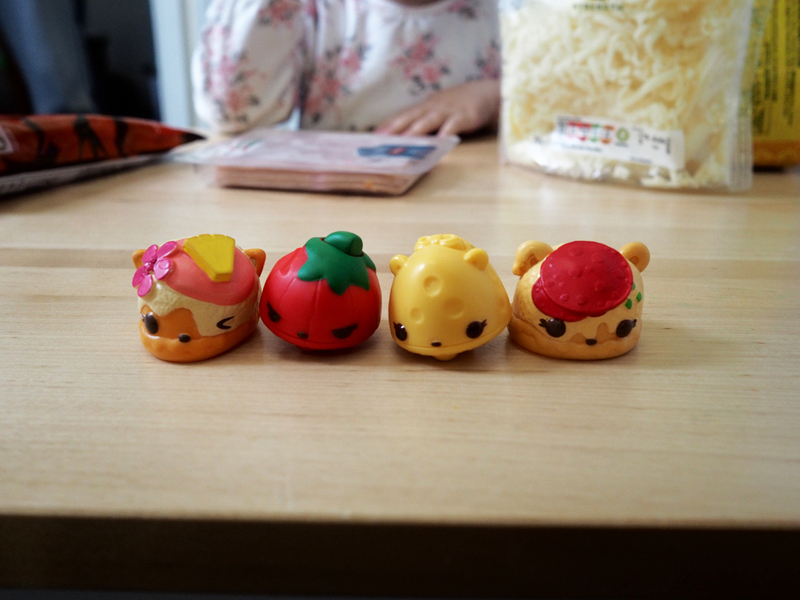 I dug out Lily's Num Noms and found myself Pina Aloha, and Peppy Roni. I know that Lily has the entire pizza collection but she has so many its not always easy to find the ones I want in a huge pile of them. Then I got a cheesy and tomato Nom and invited them all to join our cooking. We got out all the ingredients. Lily doesn't like Pepperoni so we decided to use ham. While I started to toast some bread under the grill, Lily played with the num noms and waited. Then it was her turn to cook. 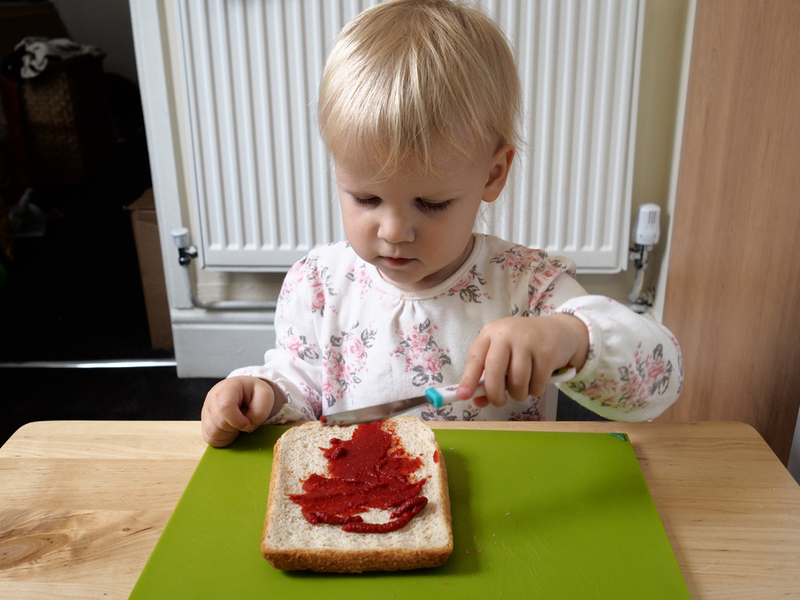 First she got to spread the tomato puree. 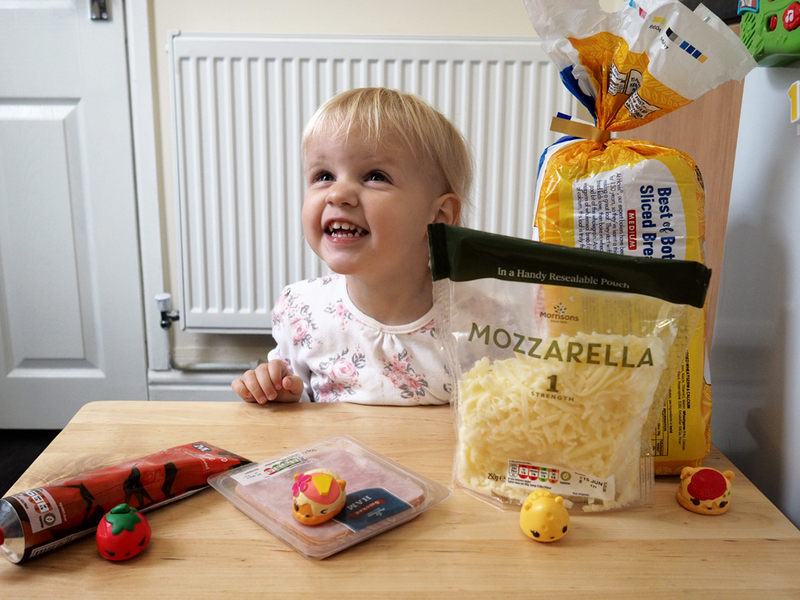 Then she added ham, then cheese and then ham again. Lily did such a great job and barely needed my help. We made 2 slices and used the ends of the bread. Next job was mummy's and that was putting them in the oven to cook. This took around 5-10 mins. 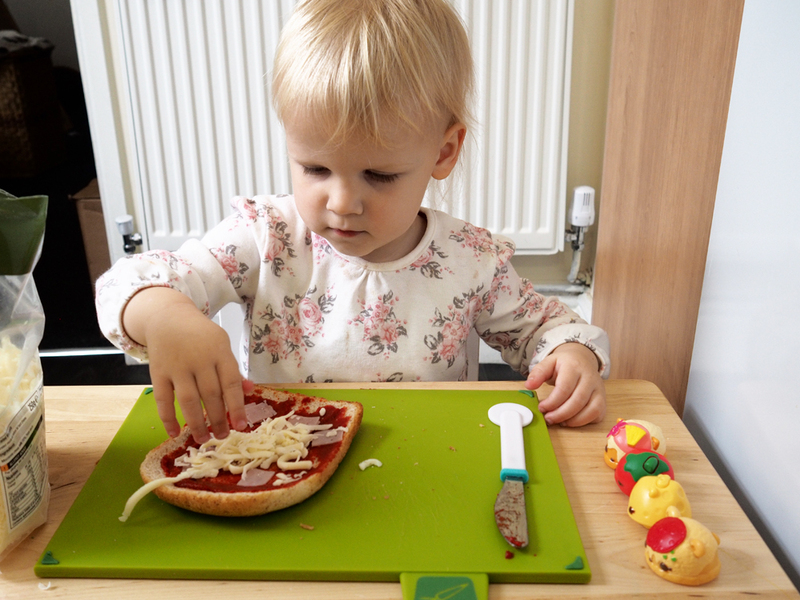 As they were cooking I got Lily out a plate ready for her sandwich. Lily put the 2 motorised Noms onto her plate and was so amused to watch them go round in a circle on it like they were chasing each other. When they were ready I got out both pieces of bread, placed them on top of each other and cut them in half and Yuummmmmm we have made a pizza sandwich! 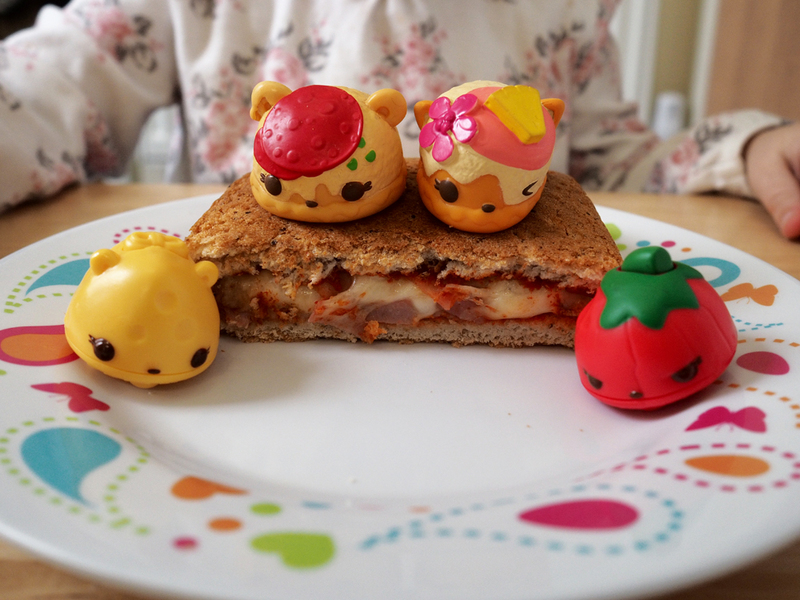 Lily was very impressed as were the Num Noms who happily jumped on top of the pizza sandwich. Now it was time to taste. Lily had half and I had half. The verdict! Super Nummy!!!! Its such a great little lunchtime snack that you can get your child involved in cooking. Then getting the Num Noms involved to help create even more fun. So if you don't yet own Num Noms, I would really suggest heading out and grabbing some from the store. 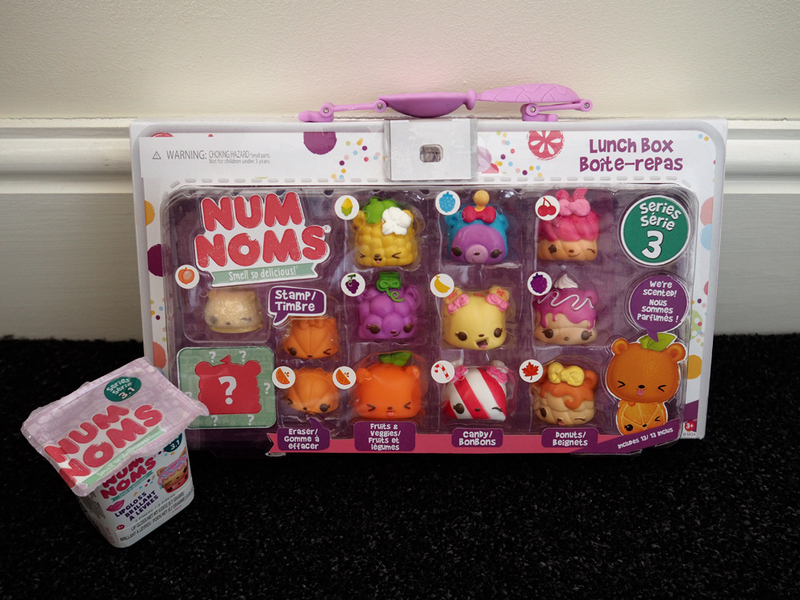 We can't wait to try and make more Num Nom Crazy Creations! Are you feeling hungry yet? What crazy creation would you make? OOOH This is so cool - my daughter has just gotten into num noms! I am so going to take a selection of NOM NOMS when we visit my great nieces and have a cooking party like this!